Ten weeks of marathon training down, for weeks to go till Canberra marathon. This training cycle has gone quite quickly and in the recent weeks it has started to come together and I feel like I am getting ready to run a good marathon. This week I gave myself a couple of days to recover from Port Macquarie Half Marathon last Sunday. This result has given me confidence that my running is on track and the motivation to push hard over the last few weeks of hard training till the marathon. Monday I felt sore in the legs and my recovery run was only 6km and fairly painful. Tuesday was a planned rest day and this was well timed as the legs were still pretty sore. Wednesday the legs were still sore but I decided to push on with my planned hill session. Hills felt quite good once I got started and I managed to complete this session relatively comfortably. Thursday was a flat 10km aerobic run. Legs were starting to feel better by this stage of the week. Friday was my long run day this week and I felt really good for the majority of the 2 hours 40 min I ran covering just under 33km in this session. Saturday was another aerobic run of 7km on fatigued legs from the previous days run. Sunday I attempted a tough interval session. Goal of this session is to increase my overall speed while in a fatigued state. After a warm up I ran a 10km comprising of 4 x 2km at half marathon pace (3:45-3:50 min/km) followed by 500m hard (3:20-3:30 min/km) after each 2km. Tough part of this run is to go back to half marathon pace after a hard 500m and recover from the effort at a high cruising speed. For the most part I was happy with this run but it certainly hurt and made me work hard. Overall 78.5km run for the week another consistent strong week. This week I am planning another strong week. Hoping to get my mileage up towards 90km which is about my limit currently with my work, family and study schedule. This week there are three significant sessions to begin to peak my training towards the marathon. Hills have been replaced by tempo for the remainder of the preparation. Strength work is now completed and it’s time to peak my speed and endurance for the marathon. Tempo session on Tuesday is relatively straight forward with three tempo efforts to work on my marathon cruising speed. This pace should feel relatively comfortable in my current condition. Intervals on Thursday is another key session to build speed. Keeping these efforts relatively long and more specific with marathon training. 3 min at good pace with a rest of 90 sec to lower my heart rate and get me ready for the next. Eight of these efforts will be a challenge but one I should be able to handle. A session I like to do three weeks from a goal marathon is this 3 x 14km with 30 min rest between at goal race pace. I haven’t decided what goal race pace is yet but it will be 4:10 min/km or slightly lower. Aiming to beat my marathon best of 2 hours 57 min. This session is hard, very hard but when I nailed this session three week before Seoul marathon I knew I was going to run my best race. This session is as much about building speed and endurance as it is about building confidence. This is a session I am already anxious about running next week. Looking forward to another good training week. 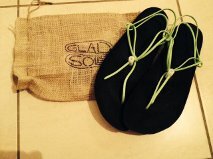 This week I ordered myself a new pair of Gladsoles trail sandals. My current pair have now run 1100km and are showing major signs of wear on the sole. They are also starting to become quite thin and lost some of their structure meaning they aren’t as stable when running as previously. I am still currently running in them but they are ready for a change. Bear in mind they have run 1100km over every type of terrain possible with at least half these kilometres on roads. They have served me well and motivated my transition to minimal running because of the ride they offer. I’ve never had a pair of running shoes last 1100km, usually the midsole breaks down after 400-500km and sole material deteriorates in a similar time. My Gladsoles sandals costs half the price of some of the running shoes I have bought in my past and lasted twice as long. When I purchased these sandals I was planning on them complimenting my normal minimal running shoes and running in them occasionally and this is what I did for the first 12 months. As my transition to zero drop running progressed I ran more in sandals and now do most of my running in sandals. The new Gladsoles trails that I have ordered use a new material to the original trail model I purchased about two years. I emailed Rich at Gladsoles about the difference and found out the new material is Vibram Gumlite which is a little more dense then the previous sole. It will take longer to mould to your feet, but provides a little more protection against sharp rocks. They are an 8 mm sole, the same as the previous trail model. I am looking forward to running in the denser sole as slightly more protection will be welcomed when on trails. When running in just an 8mm sole you get phenomenal ground feel but you do feel the rocks and sharp objects you run on. With this information I ordered a new pair but was faced with the dilemma of which lace and lace lock colour to choose. This is a seriously tough decision as there are plenty to choose from. Previously I have used neon orange, neon green and yellow on my sandals and changed the lace colour a few times. For these sandals I have chosen olive green laces and a black lace lock. I often get asked when running in sandals questions like, “How do you run in them?” The truth is I don’t know how I ran in shoes that were heavy and inflexible for so many years. I am just as fast if not faster in sandals than shoes and I feel happier and more motivated to run when in sandals. I’m looking forward to another 1000+km of running in these new sandals. In a weeks time I will start my focus on my next goal race being the Beach to Brother Trail marathon. I will be running this race in Gladsoles Sandals with olive green laces. This race offers a range of terrain, beach including both hard and soft sand, trail, roads and pathways before a 2.5km vertical climb to finish the event. It will be a tough event and one that I look forward to competing in. The debate and studies dedicated to barefoot or minimal running have been done to death in my opinion. That is on both sides of the fence, those trying to convince people that barefoot running will either fix injury concerns or cause others. 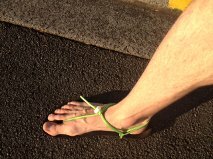 Barefoot running is not a panacea to solve or injury concerns and when transitioned correctly will offer benefits. Disclaimer: My opinion is based on personal experience and not on a medical qualification. I certainly don’t profess to be an expert in biomechanics. The best thing that transitioning to a barefoot or minimal footwear has done for me is improve my foot strength. Better foot strength has given me better mobility and a strong base for every step that is taken when running. Prior to my transition to minimal footwear I was a typical runner that wore the same footwear every time I needed shoes and was regularly injured. I was prescribed orthotics to heal injuries that I had on my feet and lower legs. I decided to transition to a lighter, more flexible shoe with a much less heel lift and throw away my orthotics after continuing to be injured. My stubbornness insured that I transitioned far too quickly and suffered calf problems. When I overcome my stubbornness and transitioned correctly. And by correctly I mean slowly I began to see the benefits. The benefits of an improved running form, a forefoot landing and growing foot strength. My running is by no means the finished article and I still work regularly on my running technique, foot landing, eliminating over striding and the strength of my lower limbs. Better foot strength has given me better running efficiency. I can run with an increased leg turnover and run faster for longer then previously. Normally when a runner injures their knees or their back they will go to physiotherapist or physician and are prescribed strength exercises to strengthen the area that are injured. Often when a runner injures their feet they are prescribed orthotics like I was that don’t allow the feet to heal but immobilise the foot and hinder it’s movement when running. The best thing I ever did for my running was throw away my orthotics. If you had a bad back and were prescribed a back brace for the rest of your life most people would dispute this diagnosis and look for a better result for themselves. Many people, me included are prescribed orthotics that are to be used for the long term. I don’t fit into the group that believe that running barefoot has or will eliminate running related injuries. I do believe though that running barefoot has improved my strength in my feet, ankles and calves and this has given me a better chance of staying injury free. Running in a minimal shoe has given my feet more freedom of movement due to a larger toe box and foot strength has given me more power when trying to run faster. Minimal footwear has allowed my feet to move in their natural state and not be driven by the shoe per say. Running is about consistency and staying injury free is a key reason why your running can improve and most likely your enjoyment and motivation to run. Strengthen the feet and strengthen your running. This weeks running has been exactly what i wanted and had plenty of variety. It’s not been a big training week by any means, I’ve done 39km in total across 5 runs with the longest being 12km this morning. Returning home from Korea last week with no immediate race to train for I decided to mix up my runs quite a bit. I’ve ran a in my Gladsoles barefoot sandals, Carson Footwear Iguanas and barefoot. I’ve run over different terrains including road, beach and trails and mostly ran by myself. A had a really exciting run yesterday when I ran with my 11 year old daughter at my local parkrun. My daughter Zali has run two park runs before but this was the first time I’d run with her the whole race. The other times she has preferred to run with friends and i’ve paced her the last part after I’d finished. She has qualified for the zone cross country race at school with very little training and wanted me to help her. Her cross country is 3km so we paced her to 3km and then let her walk/run the last 2km. Zali did a 28:30 for the 5km and I had a smile on my face afterwards running with her and sharing my love of running. I look forward to the next time we can do this together. I’ve really enjoyed mixing up my training. Barefoot intervals on the beach on Friday, parkrun Saturday and a hard 12km this morning. 12km this morning was 2km on at 3:50min/km and 1km active rest between. Although i’m not training for a specific race I want to keep my fitness and speed over the balance of the time until i find a race and start focusing on it. While I’m on the variety bandwagon in my running I am close to committing to Beach to Brother Marathon in Port Macquarie, Australia in September. This is a trail marathon around the beach and trails starting from Port Macquarie and finishing at the top of North Brother Mountain. This is 2.5km trail mountain climb to finish a marathon so not a marathon finish for the faint hearted. A few months ago I had a period where it was tough to go running, my motivation to go and run had been lacking and just didn’t feel like doing it. So I didn’t. For a month I didn’t run at all. Just couldn’t be bothered. I still volunteered at my local parkrun a couple of times, still searched Facebook and the internet for running related information, and still spent social time with my running friends, just didn’t run. They would all ask me if I was injured and why I wasn’t running. I told the truth, lacking motivation, can’t be bothered. They thought I was weird. I run because I love to run. I didn’t start running to lose weight or gain fitness in the beginning. I started running because it’s what i have always loved to do since I was a child and have never really stopped. So it is weird for me to tell people I can’t be bothered to go for a run. During this month I thought about going for a run a few times, my body clock will still wake me up early like a personal running alarm clock. I thought about running but just didn’t want to run. When I woke up in the mornings I drank coffee, or watched television or played Fifa on the xbox instead of running. Although it wasn’t satisfying me doing these things I wasn’t missing running so I didn’t go running. After a month of no running I could feel myself lose fitness and beginning to put on weight. This didn’t bother me as I knew I could change this quickly when I returned to running. I needed to go running again, I needed to establish a short-term goal, I needed to kick-start my motivation again. Over the past year I have not run very much in my Gladsoles sandals and preferred using minimal shoes as I have been chasing times and some race results.I have never believed I could run fast enough in race conditions in my sandals so I have run these races in shoes. I decided to put my sandals back on and go for a run. Close to barefoot, back to basics and just go for a run. It was kind of liberating to run in the sandals again and in two months since that run I haven’t run in shoes. Returning to sandals has helped me regain my motivation. I am now back to running 4-5 times per week exclusively in the sandals. I now can’t wait to put the sandals on and run. A week ago I ran a parkrun in the sandals and ran 18:20 for the 5km (my PB is 17:39), disproving my own theory that I can’t run fast enough in the sandals. Hoping to get down to my PB again soon. From not running for a month I discovered that I really want to run barefoot or as close to barefoot as I can. I had become unmotivated to go running but I still loved running. 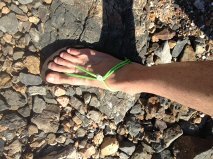 It’s helped me choose my path that I want to be a barefoot sandal runner and focus on improving my running in sandals. My marathon PB can wait till I’m ready to achieve it in sandals. I’m going to focus on what I love about running and stay motivated, it took me a month of television and Fifa to rediscover that running is part of my dna and I need to run to satisfy my own self. For now that running won’t be in shoes.